We know Speck makes some of the most protective cases on the market; we know Speck has cases for pretty much every device currently available, and we know Speck rolled out cases for each of the new Samsung Galaxy S10 smartphones. 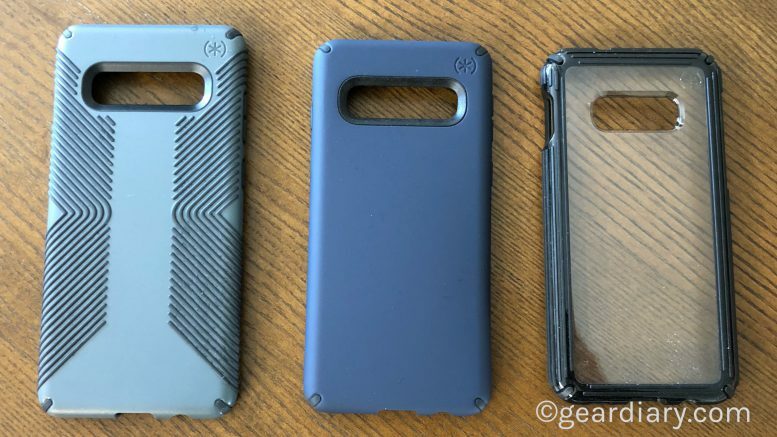 And now, you should know… we are giving away three different Presidio cases for the Samsung Galaxy S10. Unlocking Your Door Becomes Magical with the August Smart Lock Pro + Connect! Win a Huawei Mate 10 Pro Just in Time for Mother’s Day! Mother’s Day is fast approaching, and we’ve got one Huawei Mate 10 Pro to give away that will make the perfect gift. Entry is easy — just follow the directions in the Rafflecopter box below. If you’re the lucky winner, you’ll have the smartphone in your hot little hands soon! If you got one of the amazing iPhone X smartphones for Christmas, Chanukkah, or Festivus you know it’s a great pocket computer. You also know it needs a good case to protect the glass on both the front and the back. Fortunately, Speck has some great options that look great and do a nice job of protecting your pricey iPhone. I recently reviewed the SanDisk iXpand Base; it’s a simple way to back up all of your iPhone’s photos and contacts while you charge your phone overnight, and now you can win one! Psst! Want to Win a Verizon #LGV30? Read This! I’ve been testing the LG V30 since before it was ready for release. The phone is quick, smart, and it has an excellent camera. If you’re intrigued by this latest flagship phone, here’s a chance to get your hands on the Verizon version — all you have to do is enter our giveaway! Win a Huawei Honor 6x Smartphone! Spring DIY season is coming up fast, and Bernzomatic — the leader in handheld torches — wants to outfit deserving professional tradesmen with new gear to start it off right. Are you (or someone you know) a DIY’er? Then this is a giveaway you won’t want to miss.